Newman was born in London in 1801 and was educated at Oxford. While a Fellow and Tutor at Oriel College, his evangelical upbringing gave way to a more catholic understanding of the Christian faith. He was ordained in 1826 and within two years became the Vicar of St. Mary’s Church, Oxford. Newman was an avid student of the writings of the early church. Although he could be critical of the teachings of the Roman Church in his day, he was even more troubled by the theological state of the Church of England, particularly when weighed against what he understood to be the standards of the ancient church. His passionate interests in the texts of the early centuries of Christianity led Newman to question the position of Scripture as the unchecked rule and standard of the church’s faith. For Newman, Scripture was of critical importance but it could not stand alone; it had to be held in balance with the writings of the early church and the theological tradition of the church through the ages. Although the other leaders of the Oxford Movement remained loyal to the Anglican tradition, spending their vocations advocating positions similar to his, Newman found it difficult to withstand the furor of the church’s infighting, particularly after the publication of Tract 90. In 1845, he was received into the Roman Catholic Church and soon thereafter went to Rome, where he was ordained to the priesthood. He became a member of the Congregation of the Oratory. Upon his return to England he established a house of the Oratory near Birmingham where he lived for the rest of his life. Although his relationship with the Roman Church in England was at times problematic, Pope Leo XIII made him a Cardinal in 1877. He died on August 11, 1890. 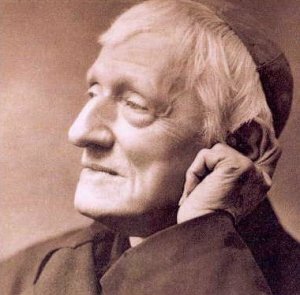 I God of all wisdom, we offer thanks for John Henry Newman, whose eloquence bore witness that thy Church is one, holy, catholic and apostolic, and who did make of his own life a pilgrimage towards thy truth. Grant that, inspired by his words and example, we may ever follow thy kindly light till we rest in thy bosom, with your dear Son Jesus Christ and the Holy Spirit, where heart speaks to heart eternally; for thou liveth and reigneth, one God, now and for ever. Amen. II God of all wisdom, we thank you for John Henry Newman, whose eloquence bore witness that your Church is one, holy, catholic and apostolic, and who made his own life a pilgrimage towards your truth. Grant that, inspired by his words and example, we may ever follow your kindly light till we rest in your bosom, with your dear Son Jesus Christ and the Holy Spirit, where heart speaks to heart eternally; for you live and reign, one God, now and for ever. Amen. Cardinal Newman’s inclusion in our calendar should be discussed more thoroughly. Important though he is, is it right to include him? ‘till we rest in your bosom’? Really? Is that what we want to pray? Readings. Hebrew reading: The Song of Solomon just doesn’t work for Cardinal Newman. Does anyone think so? Bio. Nice ‘who he is’ and ‘why he is important’ statement; and ‘He died on August 11, 1890.’ statement, though. No mention is made in the bio of Newman’s considerable literary talent, although the “kindly light” in the collect is a sly reference. Why is he honored today (his birthday) instead of the customary date of death (August 11)? I should know this – do we also honor any of the members of the Oxford Movement who stayed Anglican? I agree with Michael Hartney on the troubling language of the collect. I am uneasy about honoring someone who left the C of E to become RC, and an RC priest as well. Does anyone think that in a hundred years the C of E will honor the bishops who recently swam the Tiber? Just askin’. I am writing on Cardinal Newman & the Oxford Movement as part of my thesis. Certainly he was an important contributor to the Oxford Movement and to the Tracts. However, after reading the Apologia por Vita Suo… he’s not very collegial toward the Anglican Church, though he retained marked fondness toward some of his former colleagues. Also, he was just beatified by the Pope, in part for sticking his finger in the Anglican eye, so overall, this addition makes me rather uncomfortable. I also find the language of the collect really odd, and I say this as an Anglo- (formerly Roman) Catholic. @Cynthia: yes, Edward Pusey is remembered on September 18 and John Keble on March 29, and were before HWHM came out, as per my copy of Lesser Feasts & Fasts. Newman is certainly an important figure in the history of our branch of Christianity. It does seem a bit odd to include him in our commemorations. If we do, the collect and propers need some major work. As John mentioned, it would make more sense (if Newman is included) to use the anniversary of his death as the date. I agree that it should be date of death. However, that might conflict with Clare, Abbess at Assisi, who died on August 11, 1253…. The READINGS as selected seem fine for Newman’s commemoration, but the COLLECT is impossible for me to pray. “All wisdom” seems the wrong attribute to choose for a prayer dealing with matters of ethos and pastoral discipline, and “one, holy, catholic and apostolic” take on equivocal and provincial connotation in a context of exclusivity and rejection of other branches of Christ’s Church. “Pilgrimage towards your truth” suggests the arrogance that claims the sacraments, orders, and doctrine as proprietary to itself alone. I’m not “inspired by his words” and I’m somewhat scandalized “by his example” although I wouldn’t disallow his right to abandon this communion for another. Still, a smart man like that should have seen the Anglican ethos at its best more adequately allows for living the spirit of the gospel than the inherent contradiction of basing Christianity on authoritarianism, prescribed performance of circumscribed duties, and the emotional blackmail threatened by eternal torment predicated upon allegedly mortal sin, confessions, and excommunication for institutional insubordination. The prayer’s florid wording of “kindly light,” “rest in your bosom,” and “where heart speaks to heart eternally” seem archaic, saccharine, unnecessary, and out of character with the overall tone and content of this prayer and Anglican collects in general, besides not being anticipated in the bio in any way. This collect breaches good Anglican pastoral judgment as well as being formally flawed. It’s perfect for Newman. As for the BIO itself, paragraphs 1, 2, and most of 3 seem acceptable. From “For Newman, Scripture…” (in paragraph 3) and onwards, I have objections. Rather than engage the last sentence in paragraph 3, it should be omitted. If engaged, it should explain that interpretation of Scripture in Roman Catholicism must be subject to the teaching magisterium of the church. We should avoid obfuscating through mention of early writings and tradition, which ultimately have no authority of their own in the Roman system without official promulgation by the magisterium. The magisterium, not Scripture, is in fact the ultimate authority in Rome. In paragraph 4, some content should be offered to explain the phrase “furor of the church’s infighting.” In addition, I have no knowledge of a Roman Catholic form for “receiving” Anglicans – if his baptism as an Anglican was rejected and he was rebaptized and re-confirmed we should say so, and not gloss it over with pretty sounding rhetoric. The same goes for ordination as a deacon prior to priestly ordination. In paragraph 5, we learn “Pope Leo XIII made him a Cardinal in 1877,” but no mention is made of his prior consecration as a bishop or attendant responsibility. That should be rectified. For the most part this commemoration is in praise of a “curriculum vitae” rather than an “apologia pro vita sua.” Ecumenically, I don’t object to the former, but neither do I think HWHM is appropriate for it absent a demonstrably holy “vita sua,” — more than an ecclesiastical career with publishing credits and admission to the College of Cardinals. Thank you, Bruce, for the background. I figured it was something like that. I thought of hymns but didn’t pursue it to verify. I appreciate your response. True, I don’t especially like the phrases, but mostly what I object to is their being dropped in there without any foundation in the bio that would help us understand them. They come out of the blue and stand out oddly. I strongly disagree with including this man on the calendar AT ALL! While certainly he had the right to err by abandoning the Anglican Church, to lionize his conduct in this way is highly in appropriate and is a slap in the face to the loyal clergy and laity who dedicated their lives to improving the liturgy and theology of the Anglican Communion. It is particularly a problem in light of the recent conduct of the Roman Church in setting up a dedicated structure to steal our people and clergy, not to mention Rome’s longstanding disdain of Anglican orders,.its attacks on the validity of our sacraments, and its irrational stance on inter-communion (which I ignore if attending a Roman church). @ John– interestingly, Newman was a problem child for Rome as well. Although the Pope made him a cardinal (he was a poster case for Rome’s poaching in Canterbury’s back yard, after all), he was never made a bishop or given a diocesan cure. He pretty much kept to his little oratory of fellow-travelers, though he wrote extremely well and was widely read. (The Apologia is stunningly whiny, though!) And as for being discouraged by infighting– well, yes, when he was on the receiving end. He certainly didn’t mind slinging mud himself, whether from his stance as an Anglican or later, as RC. I just can’t see how he is a fitting candidate from Anglican observance, sorry. But in any event, he’s a fellow child of God whose life serves as an illumination of how God called him. God writes straight with crooked lines. In Newman’s words, “I shall drink to the Pope if you please–still, to conscience first, and to the Pope afterwards.” The primacy of conscience is something both our traditions share. Newman exemplifies that for me. I agree that it is a bit odd to include a famous abandoner of Anglicanism. But I just wanted to note that there are many figures listed in HWHM that never belonged to an Anglican Church. If leaving is grounds for exclusion for Newman then it would seem that many more need to be removed for simply not being. My point is that we may rightly celebrate anyone whose life is an example to the catholic Church – we need not pretend to have a monopoly on holiness in the Anglican tradition. Since we do honor Pusey and Keble, I see no need to honor the apostate Newman. Having read your comments, and having revisited my knowledge of the Tracterians, I agree with Lin Jenkins – Newman has no place in HWHM. Let hiim enjoy being honored by the RCs. “Apostate” is too strong a word. It applies only to those who have given up on Christianity entirely. Unless you are one of those die-hard extreme Protestants who believe that the Roman Church’s errors are severe enough that they can no longer be considered Christian? Episcopostate! I agree with Lin and Cynthia et al.. Let hiim enjoy being honored by the RCs. Is this book intended for use in Episcopal parishes? Or is it maybe intended only for “ecumenical” occasions? You just gotta love that John LaVoe! And I agree with all the above comments about the wisdom of including him. So if the SCLM is persuaded by them and drops the commemoration, we’ll have to search elsewhere for the honor of ‘cheesiest collect’. Otherwise this would be the one to beat. After defending the inclusion of Methodist Frederick Douglass in our calendar, I must say I agree with everyone who wonders why Newman is included here. After all this time I don’t feel any animus for Newman and I am often moved by his writings, but I swam the Tiber the other way a long time ago. In God’s bosom, I know, we will love and forgive, but the current Pope is so hostile to ecumenism and his recent beatification of Newman, as someone wrote, to stick a finger in our Anglican eyes, makes me wonder if we are being too passive. We don’t have to be hateful, but why honor someone who finally decided the C of E was heretical and schismatic? That nice Jewish man we worship every Sunday seemed to be all about inclusion and compassion. I don’t hear a lot of that in the anger about Newman above. Bruce Alan Wilson – thank you for the comment about “apostate.” I was using the term carelessly. As for Newman’s other accomplishments – such as his writing about the university – if we keep him, they should be mentioned. I read that book many years ago, and having recently retired from university teaching, I highly doubt that Newman would recognize much of American higher education as ‘the university.’ We do honor a number of non-Episcopalians and non-Anglicans, but I think Newman is the only one to swim the Tiber and be on his way to sainthood, which I hope he enjoys. I still want to drop him. Cynthia … on January 4 we commemorated Elizabeth Seton. She was an Episcopalian, and she is on her way to sainthood in the Roman Catholic Church. Re Michael Hartney’s comment,: just above, I believe St. Elizabeth Seton was canonized some decades ago. She was the first saint to have been born in the US, preceded by Mother Cabrini, who was an immigrant, and the first US resident to be canonized, I am fairly certain. I think that The Boston Globe published a portrait of St. Elizabeth Seton and included a copy in its newspapers, when she was canonized.. I think it would be wonderful to have Cardinal Newman in the calendar, since I love his poetry in “Praise to the Holiest in the height” and “Lead, Kindly Light,” and the beautiful prayer included in the latest edition of the BCP, on page 833, “O Lord, support us all the day long, until the shadows lengthen”. Is there a possibility that Newman’s beatification is just a tribute to his saintliness, rather than anything directed at Anglicans? Including a commemoration of Cardinal Newman would be a generous, reconciling act, I think. The “rest in your bosom” language (which makes the Collect memorable, if not unique) surely refers to the gospel story of poor Lazarus resting in Abraham’s bosom, doesn’t it? (Luke 16:22: “The poor man died and was carried by the angels to Abraham’s bosom” [RSV]) Or perhaps the Beloved Disciple, who leaned on the Lord’s chest at the Last Supper (John 13:25). On December 18, 1959, Elizabeth was declared Venerable by the Sacred Congregation of Rites of the Catholic Church. She was beatified by Pope John XXIII on March 17, 1963, and canonized by Pope Paul VI on September 14, 1975, making her the first native-born United States citizen to be canonized. If Newman’s life was “a pilgrimage toward truth,” then it ended oddly, at least from an Anglican point of view. The collect reads like an invitation to follow Newman to Rome. If we feel we must prove out ecumenical creds by honoring at least one Tractarian apostate, surely Henry Manning is a better choice. He may not have been in Newman’s class as scholar and writer, but Newman was not in his as a Christian. Besides, we have plenty of Anglicans worth remembering from the same era: the “Seven against Christ” of Essays and Reviews (only one of whom rates a date now, and only because he went on to be Archbishop of Canterbury) and Bishop of Natal John Colenso. All, interestingly enough, were persecuted by the Tractarians of their day for their use of then new but now commonplace methods of Biblical criticism. Colenso earned the further ire of the High Churchmen by advocating the Christian treatment of the native peoples of Africa. This is like putting Benedict Arnold on a U.S. postage stamp. I recognize his following his faith and that Tract 90 as a brilliant piece of work at the time, but his later going to Rome and sucombing to evrything we wrote against seems like we ought not to include him. While I do agree that Newman is an odd choice there’s another issue that his consideration has brought up that I think is far more important. The idea of having an Anglican test to count as a Christian worthy of commemoration by the Episcopal Church is simply beyond me. The vast majority of the saints have not been Anglicans. Also, some seem to be suggesting that there are merely a few non-Anglicans listed in HWHM. There are in fact a lot of non-Anglicans in HWHM. Just since the New Year there’s John Bosco, Newman, Frances Jane Crosby, Frederick Douglas, and figures like Rublev who while later important in Anglicanism do not stand in a direct historical line like the medieval saints etc. Frankly while there is a clear historical line of influence we would do well to remember that the Patristic Fathers, the Medieval mystics and schoolmen, as well as most of the Reformers were not “Anglican” either. We include them, rightly, because we agree that whatever good we’re about is what they were about too. We should keep our eyes on the saints and simply rejoice when a few of them are also Anglicans rather than struggle to find a full calendar of acceptable Anglican saints. Charles Fogarty wrote this very good question, “We don’t have to be hateful, but why honor someone who finally decided the C of E was heretical and schismatic?” He also pointed out the RCC’s recent ugly triumphalism. The only answer I can think of is that responding to hate with love seems to be the only thing that works. And I want to apologize for my short snippy comment above, that was sanctimonious (if there was a delete button, I’d delete it. Lesson learned: I should try to not be a schmuck, and think about charity before pressing the “post comment” button). I appreciate the great dialogue on this issue. I’ve never posted here before, although I’ve read this site regularly. Who knew Newman would touch such a nerve for me? Sorry again for my brusqueness. I’ve given much though to the idea of Anglican Saints. I think, in our Anglican way, that they are not so much the holiest people as the best examples of our universal priesthood. I’d be uncomfortable recognizing Newman in the calendar, not because he’s unholy, unworthy, or apostate, but because I don’t think he sets a good example for the majority of Anglicans. He’s more than a lapsed Anglican theologian, he is a theologian famous, in argument and practice, for deserting local Christianity in favor of the universalism he found with the Romans. He makes compelling arguments, but to follow them to their logical conclusion is to abandon the community we hold dear. I’d dearly hate to set that up as an example, particularly because I have found Roman Catholicism to be very local in it’s own ways. I feel strongly that Newman should not be in our calendar. Lucas Mix makes a compelling argument. How can we honor someone who dishonored us? I can’t say that I know why, because I don’t. I just know that the ELCA does not recognize Neuman in any commemorative way. I used one of his pre-RC sermons for one of my liturgical classes at a Benedictine RC seminary—or should I say School of Theology since that is on my transcript and I am a woman…. I happened upon these comments perhaps a full day after the actual date of commemoration, expecting to see maybe a handful and to even learn a thing or two. I must say that I wasn’t prepared for what I found instead: a virtual litany of partisan paranoia passing itself off as Christian! And I really do mean what I say by each of those words, I looked them up to make sure. I’m assuming from your comments that you’re not a regular reader of this blog, because I think if you were you’d know that the regular contributors to it don’t merit the criticisms you’ve made. There are some comments here from people that aren’t regulars, but I don’t see in them what you see either, even if some of them put their points more strongly than is usually done here. As far as partisanship is concerned, the contributors to this blog certainly represent the full range of opinion in the Episcopal Church, but have managed to get along pretty well for the seven months I’ve been participating. If you’re referring to the criticisms of the Roman Church, I don’t think anything has been said that misrepresents that church or puts an unfair spin on any of its teachings, but perhaps there was something I missed that you can point out. As far as paranoia is concerned, I don’t understand your comments at all. No one’s expressed any fear, rational or not, that I can detect. You may suspect that fear is the unspoken motivation for comments that aren’t actually expressing fear, but I wouldn’t conclude it without asking a probing question or two. As for ‘passing itself off as Christian’, I would urge you to revisit that thought. I’ve never seen any reason to doubt that all the contributors to this blog are sincere and committed Christians, not matter how we may differ in living out our commitment. The implication that those criticising the collect do so because they aren’t open to new experiences is also one a regular reader would not have made. There’s no one commenting regularly here who hasn’t welcomed some of the new commemorations and their propers, as well as criticised some of those that are familiar. Fair enough, and I do apologize for any offense (or misunderstanding on my part). Since JHN’s inclusion has elicited much comment, I add a bit of history, some personal. When bios were first added to LFF I was asked to write five of them, one of which was for Pusey. While my other contributions were accepted and have stood the test of time, the Pusey one was not published because it had too much in it about Newman who, according to the then extant rules, could not be included. So I greet JHN’s inclusion now in with a sense of satisfaction. It seems to me that he is worthy of inclusion in HWHM if only for two reasons: his classic of Christian spirituality (the “Apologia pro vita sua”) and his (it not too much to say, nor my opinion alone) watershed contribution to theology in the “Essay on Development of Doctrine” (cf J. Cameron’s prefatory essay to the Penguin edition of JHN’s “Essay” and also J. Coulson, “Newman & the Common Tradition”). Pusey himself wrote a letter within days of JHN’s departure from the C of E that was prophetic of Newman’s subsequent influence theologically, ecclesiologically, and ecumenically. To deny Newman a place in our calendar as an incontrovertable exemplar of holiness would be simiply to egage in a fit of Anglican pique and to forget that we are all called to the forgiveness of sins and offenses (real or imagined). I said above that I agreed with the reasons already offered for not commemorating Newman, but in the light of the subsequent discussion I see an additional reason. It seems to me that one of the most important qualifications for inclusion in the national church’s calendar is that there be wide agreement that a particular commemoration is appropriate, that no commemoration be controversial. After all, any group of Episcopalians can commemorate any one they want, and invite the whole community. No one needs the approval of the SCLM to commemorate Newman or anyone else. But I think that for someone to be included in a national calendar, there should be pretty broad agreement that the person belongs there. This commemoration does not meet that standard, if those who comment here are at all representative. There has actually been quite a bit of discussion over the months about the standards for inclusion, and Newman is not the only one whose suitability for commemoration has been questioned. It’s always difficult to discuss the general issue in the context of a particular commemorand, and I hope before this blog closes a way could be provided for people to talk about it more generally. Jay, you say you looked up each of the words you mention above, but I think you’d find if you looked really carefully that the basic meaning of “litany” is not “list,” but “prayer.” The use of the word to mean “list,” in my opinion, devalues the “litany” in our Book of Common Prayer, as well as the use of the word in other contexts. When we pray the Litany there may be a lot of things to pray for, and we may get impatient, but if we treat it like a “list” and not prayer we’re missing a lot. –Also: I’ve been on this discussion list since close to the time it started, and am glad that a wide variety of “churchmanship” is represented. I think that’s partly why TEC said the SCLM had to get opinions from the church at large. So we have “Anglo-Catholics,” “Evangelicals,” “Liberals,” etc. all expressing their point of view, and sometimes there is disagreement. But I would hope that we may all feel free to express how we see things. I think every contributor has followed the guidelines set by SCLM. This is one reason why I’ve enjoyed this blog so much. –About Episcopalians/Anglicans who became RCs, but are nevertheless included in our calendar for other reasons (we may not agree that they had to leave us in order to find “the truth,” but there are other things about them that are exemplary): Bishop Hobart did try very hard to convince Elizabeth Seton not to “go to Rome,” and she lost friends because she “left.” Psychologically, one could say she was looking for a faith strong enough to see her through the loss of her husband and her economic losses as well–theologically, one of the things she said was that the doctrine of transubstantiation made Christ truly real to her. She had never heard of it until Italian friends in Italy told her about it. And although Cranmer’s words in the BCP make that an option, as did things Elizabeth I said, it’s denied in the 39 Articles and in at least one tract by Cranmer. –Sadly, the really divisive issue today in TEC–the one that made so many people leave it recently, the one we can’t seem to accept ambiguity on–is the sexuality one. You’re right, “litany” isn’t one of the words I looked up… Thanks for gracefully correcting my understanding. Newman was a great Anglican before he became a grear Roman Catholic. He was a remarkable holy man. Newman was a great and holy Anglican before he became a great and holy Roman Catholic. His desertion of the Anglican Churcheft a bad taste ij the mouths of his Tractarian follows, but I thuink we need to share him with the Romans and celebrate his like and work, even if we disagree with his departure for Rome.. Cannot we both celebrate his life? The subtitle needs to be changed, because (although not the reason for his being listed), Newman became a Cardinal. It is not the highest ecclesiastical level he reached in The Episcopal Church that matters. In a sanctoral calendar that respects non-Anglican traditions, it might seem disparaging to list him merely as a “priest”. I suggest “Leader of the Oxford Movement”. First paragraph: here again we have the “headline writer” at work, proposing a first paragraph that summarizes the saint’s accomplishments, presumably for the benefit of those too lazy to read more than a single paragraph. This has not been the style of Lesser Feasts and Fasts, and I hope it will not become the norm for HWHM. I see no good reason for this commemoration being on the date of his birth. (I can’t believe it is “sour grapes” because he didn’t die a member of The Episcopal Church) I guess when this entry was first suggested, he was to be recognized on his birth date because the date of his death was the same day as we commemorate Clare. Now that we permit two commemorations on the same day, I suggest we move the commemoration of Newman to August 11. I think it is a surprisingly classy, high-road sort of thing for us to include John Henry Newman in HWHM. I think we Anglicans can take great pride in his launching and in honoring a soul for whom NOWHERE but Heaven is a perfect fit. I would agree, however, that the collect needs some work; “who made his own life a pilgrimage towards your truth” carries some unpleasant implications. Displaying ecumenical generosity like this is a good thing; perhaps one day it will be reciprocated! Editor’s note: Kate, thanks for your comment. Next time, please leave your last name, too. –Ed.